WordCount.org is an interesting site for logophiles. A logophile is a lover of words, but if you are a logophile, you probably already knew that. WordCount is a simple site that scans the 100 million words of the British National Corpus to determine the frequency of (at present) the top 86,800 words. These are all the words used at least twice. Understand that the site scans British rather than American English. This perhaps explains why brilliant (2,814) ranks so much higher than awesome (13,052), parliament (1,049) so much higher than congress (1,867) and metro (12,688) so much higher than subway (23,659). British spellings predominate too: colour (867) beats color (27,077), aeroplane (10,827)) outranks airplane (33,136) and theatre (1,742) crushes theater (44,393). Also, particularly British words like loo (12,307) and pram (16,441) place fairly high while Americanisms like dude (35,307) and bleachers (78,443) are ranked low. Still, I doubt there would be much difference in the top 100 words, which I present below for your perusal and pleasure. The three articles are #1 (the), #5 (a) and #34 (an). The three most common coordinating conjunctions appear at #3 (and), #25 (but), and #32 (or). 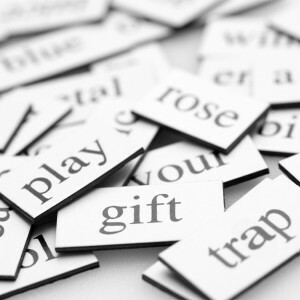 There are 30 pronouns on the list, 20 prepositions, 13 adverb/adjectives, and 17 linking/helping verbs. 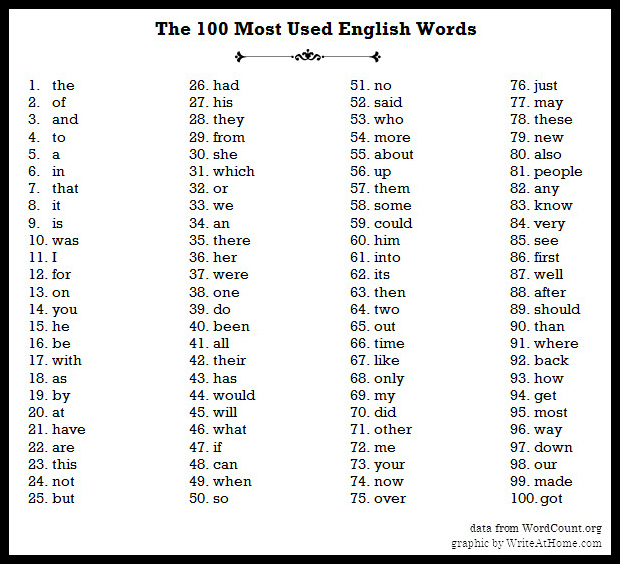 Only two nouns made the list: time (#66) and people (#81). Bloggers love comments. Leave yours below.